DRAG RACE: Dodge Charger vs. Tuned Honda Civic! - Muscle Cars Zone! DRAG RACE: Dodge Charger vs. Tuned Honda Civic! After seeing a Dodge Charger beating a C7 Corvette, it is now time to witness another matchup! 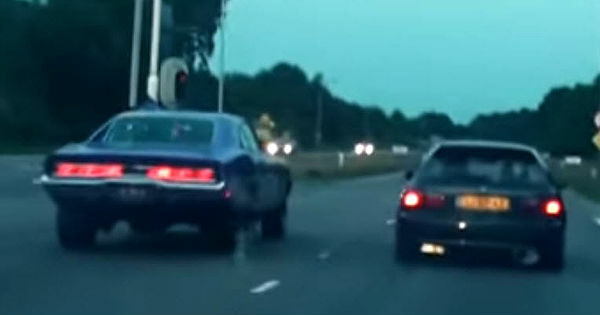 Dodge Charger versus a tuned Honda Civic 2.2 V-Tec ! At the beginning of the video we had a glimpse underneath the Honda`s hood! Pretty solid engine – but will it be enough to beat experience?! You need many things to win a race: toughness, experience, skills and a powerful engine of course! Having muscles but not having brains is equal to a disaster. Luckily, Dodge Charger has brains and muscles – American ones! This chubby old timer vehicle proves once again that it has no competition when it comes to racing in a straight line! We might argue that the Honda Civic is simply not made for drag racing – but then again – it was a participant in this clash! Maybe it will have more luck in a classic race. We wish him all the best. However, it is proven once again that tuning is not all that takes in order to win races. It can work perfectly for you until you meet a Charger on the streets! So watch the footage bellow, enjoy the next few minutes and please share it with your friends on Facebook.